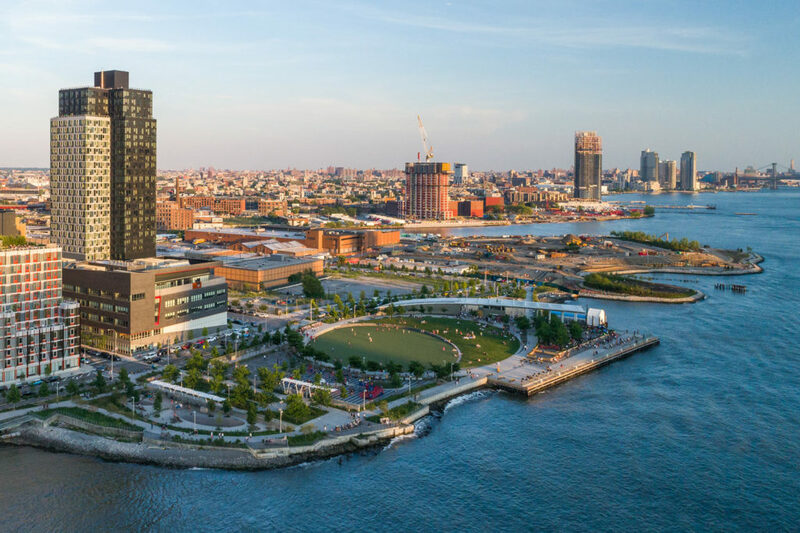 One of city’s most ambitious and complex developments in decades, Hunter’s Point South aspires to be a new kind of project. 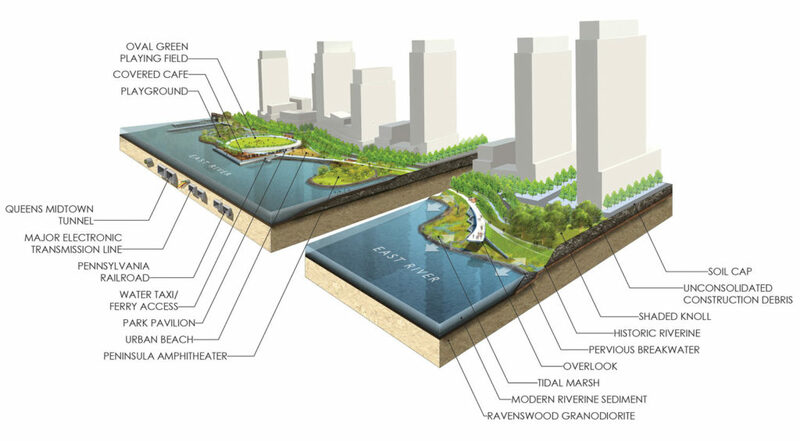 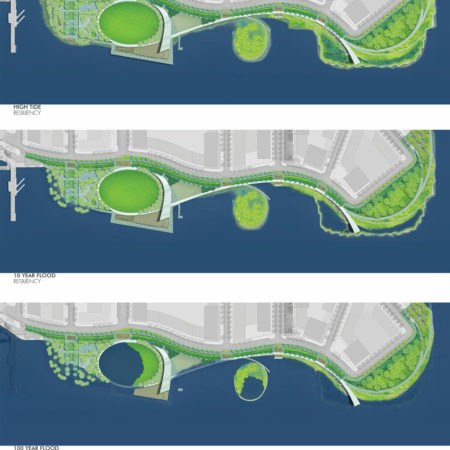 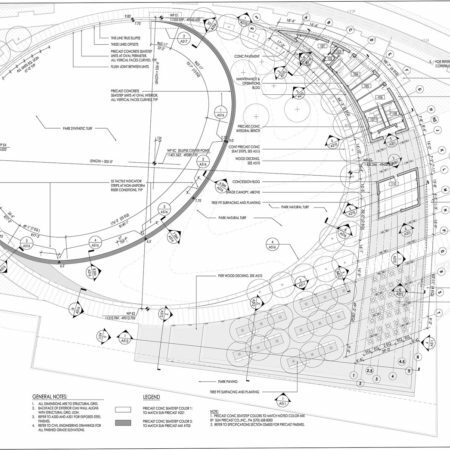 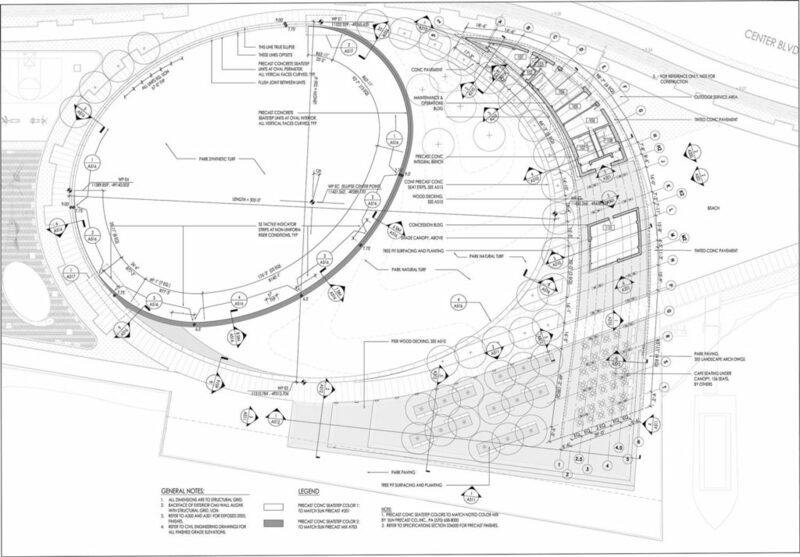 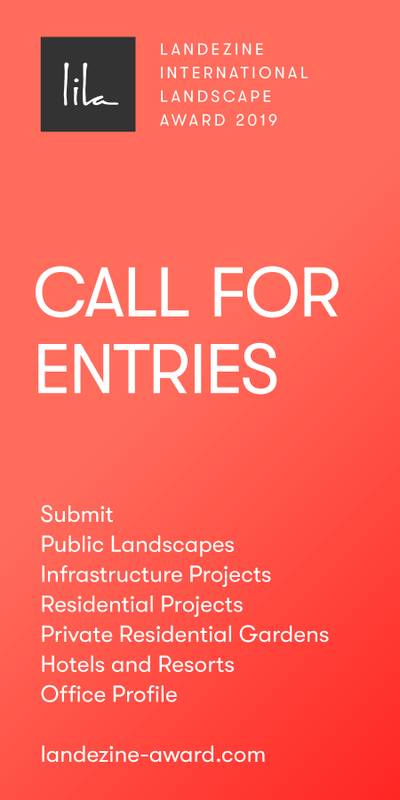 Focusing on designing a park, streetscape, and infrastructural system that was innovative, flexible, and aspirational, the proposal wove together all designed elements of the project and thus encouraged traditional roles of the core design team to expand, blurring the lines between landscape architecture, architecture and engineering. 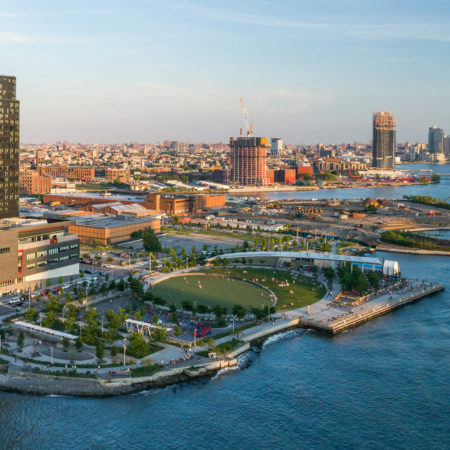 Surrounded by water on three sides, this post-industrial waterfront site is separated from Manhattan by the slender band of the East River. 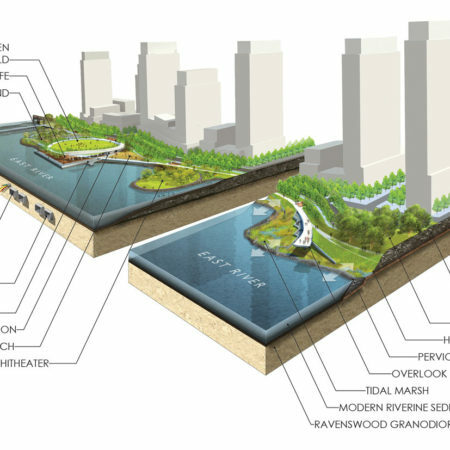 Two hundred years ago the site was a series of wetlands. 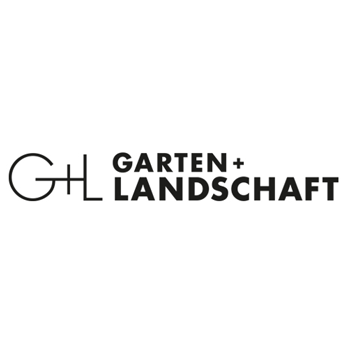 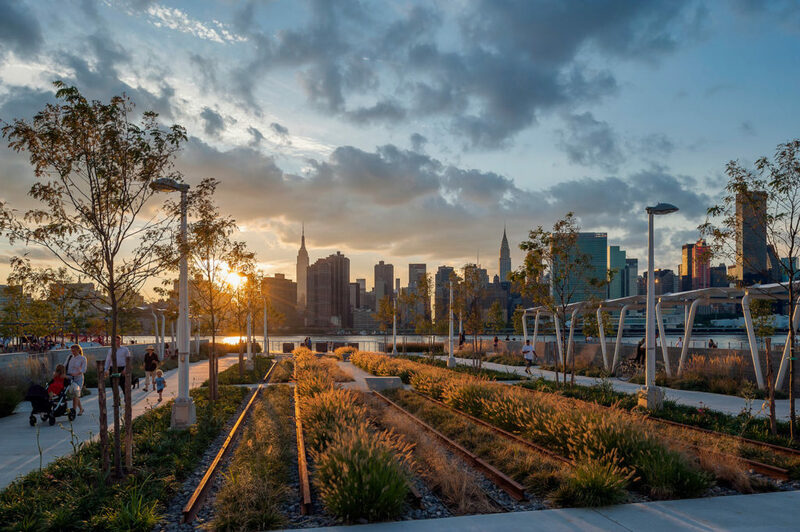 Currently the site’s industrial identity reflects its strategic proximity to waterfront and rail exchange, eliminating all signs of its early ecologically rich history. 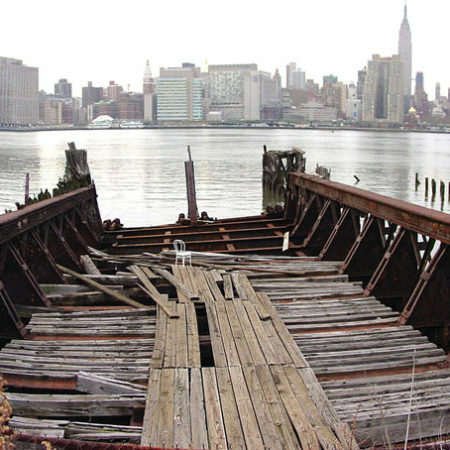 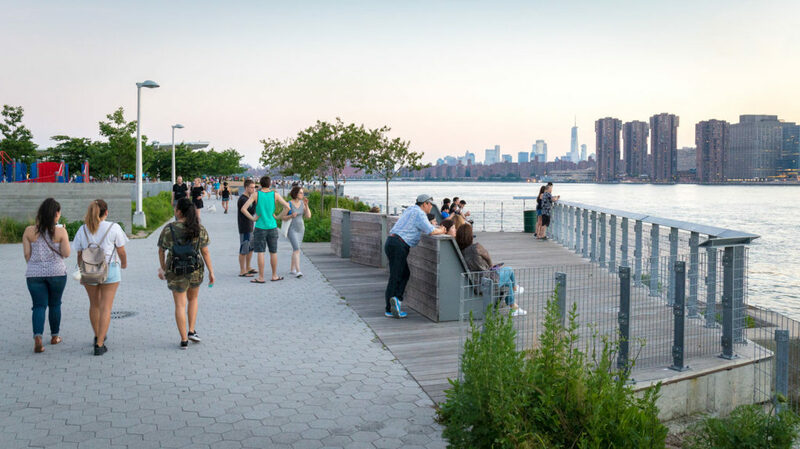 Today, this legacy presents a paradox: industrial remnants and a steep bluff descend to a beach of decaying piers overlooking the urbanity of the Manhattan skyline. 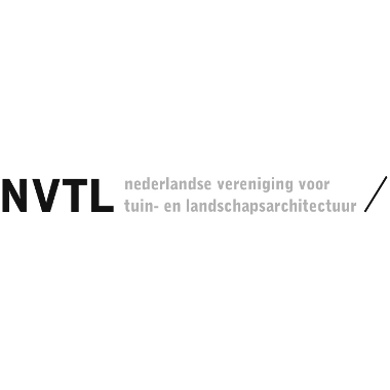 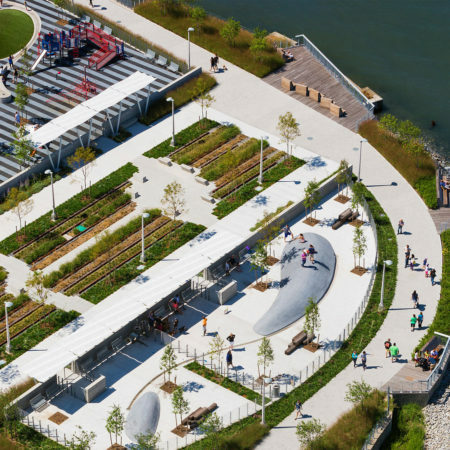 The design embraces these diverse identities and proposes a series of parallel perimeter ecologies that link the northern and southern ends of the site. 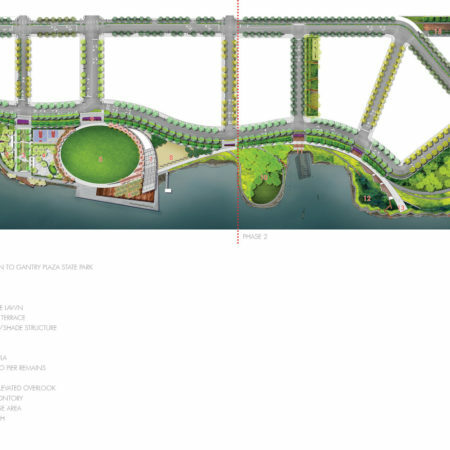 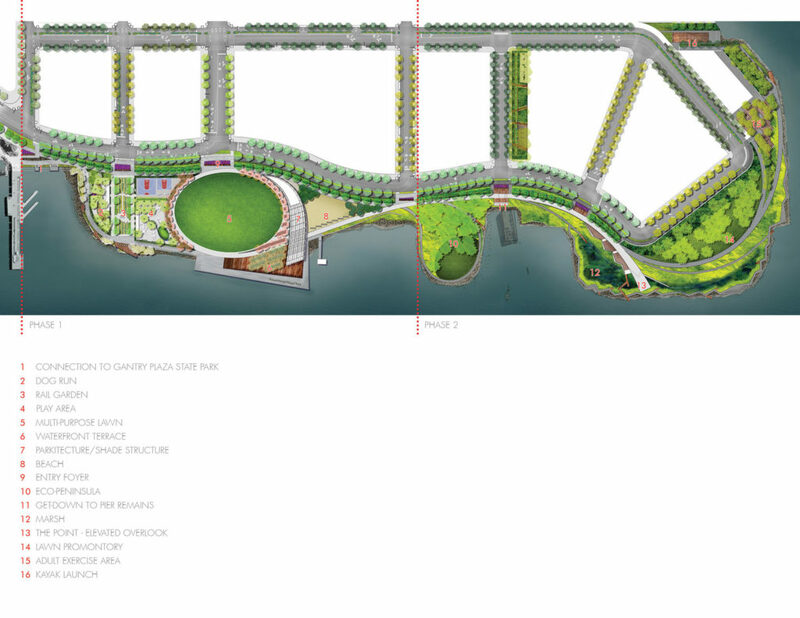 These linear strands form new ecological corridors which run parallel to the water’s edge, providing multiple systems of paths that link the major precincts and programs of the park. 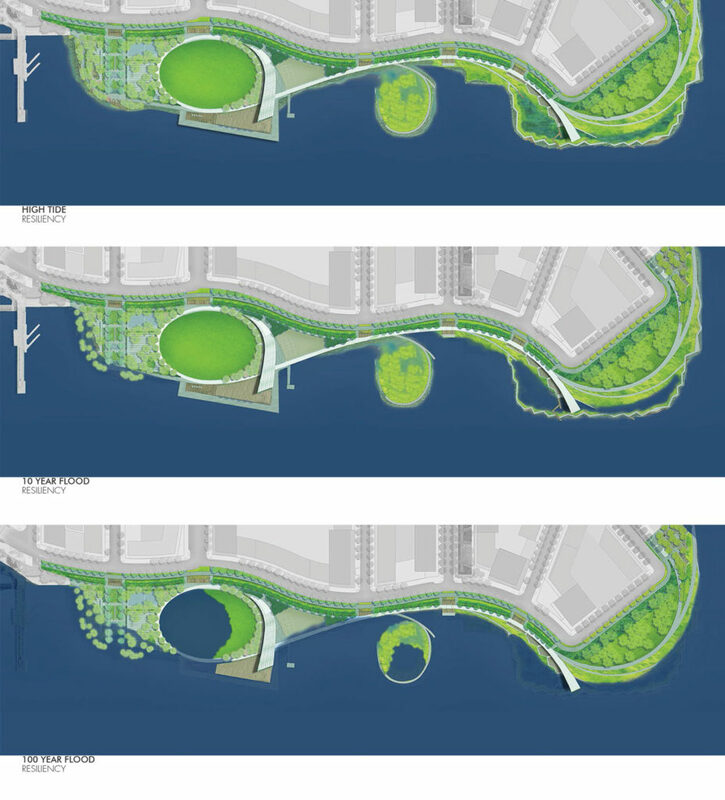 Along the water, existing concrete bulk-heads are strategically replaced by new wetlands and paths creating an infrastructural “soft” edge. 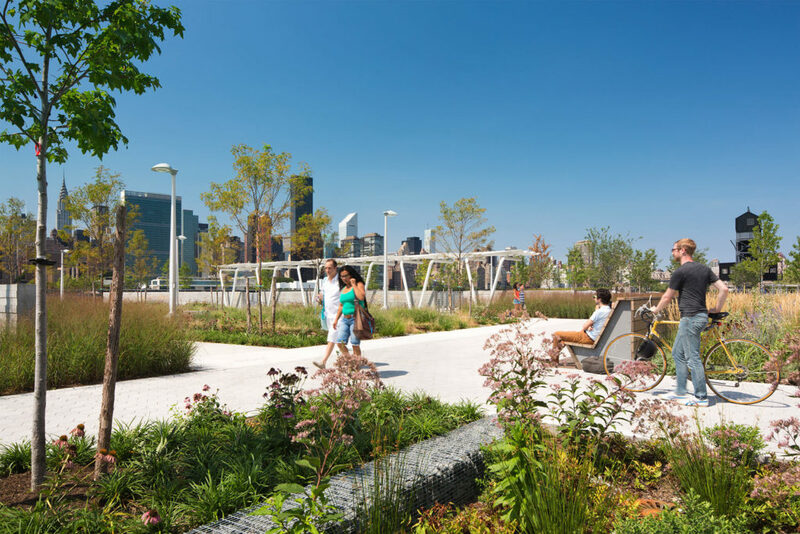 The intersection between the city and the park is defined by a richly planted bio-swale. 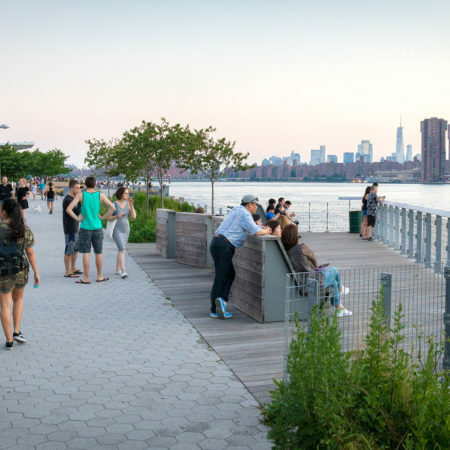 The park’s highly irregular perimeter varies widely from slender to broad widths of land between the city and water, calibrating the scale of the program elements throughout the park. 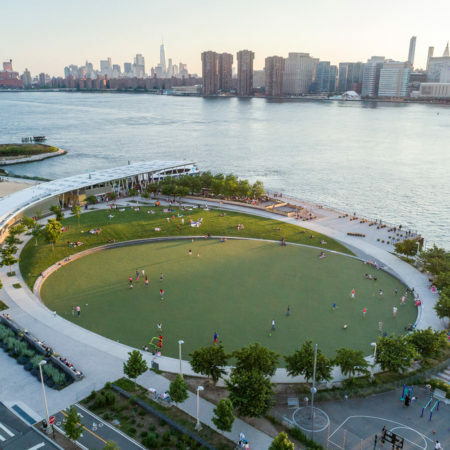 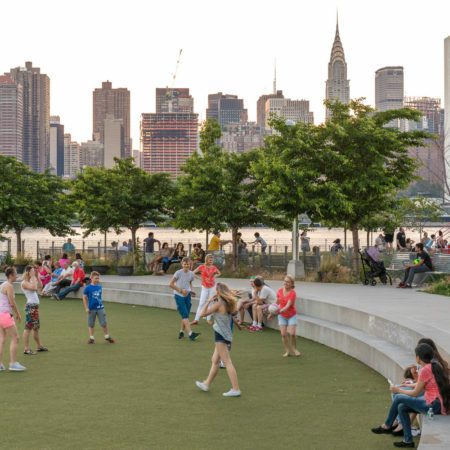 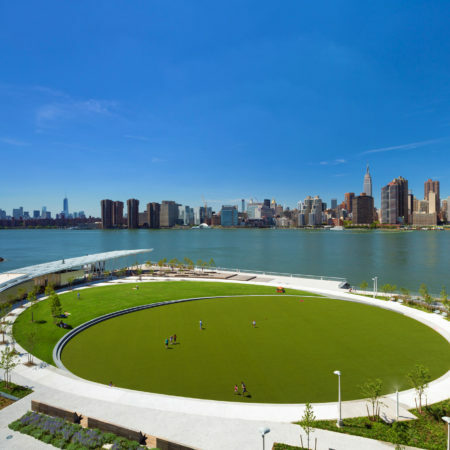 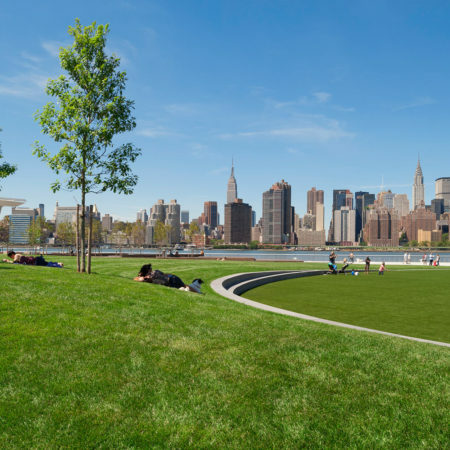 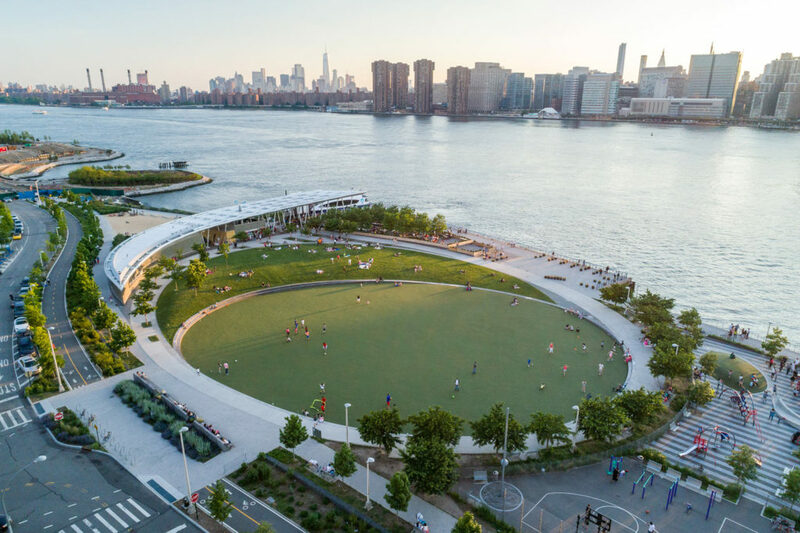 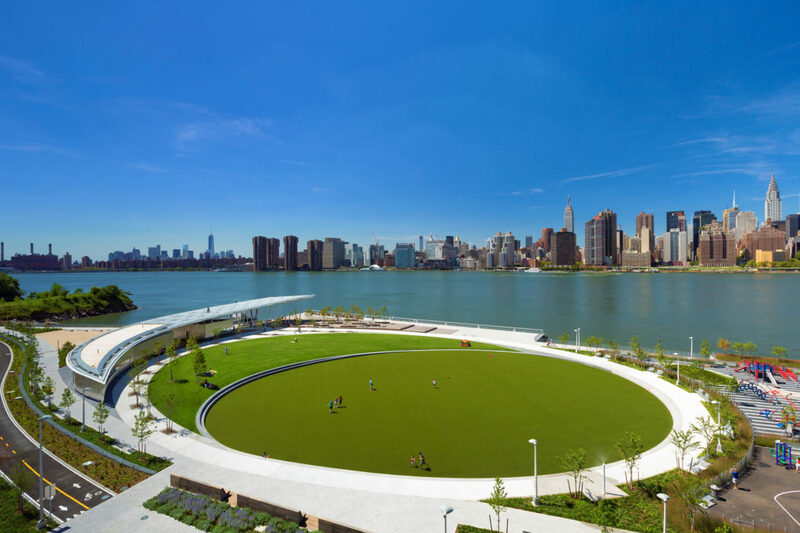 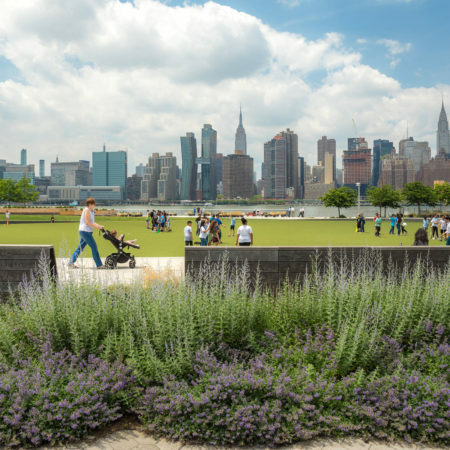 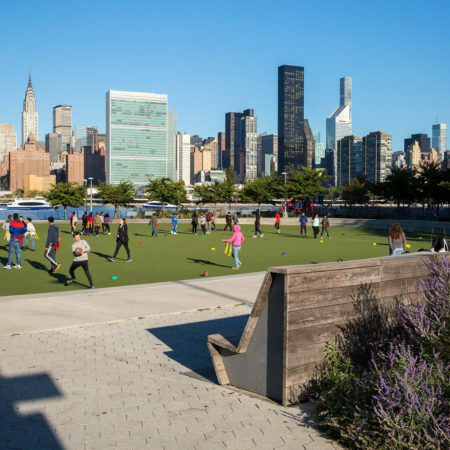 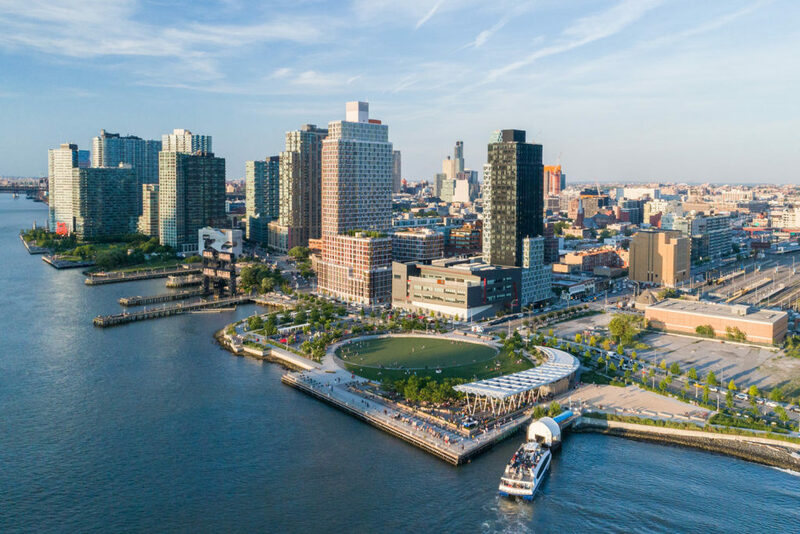 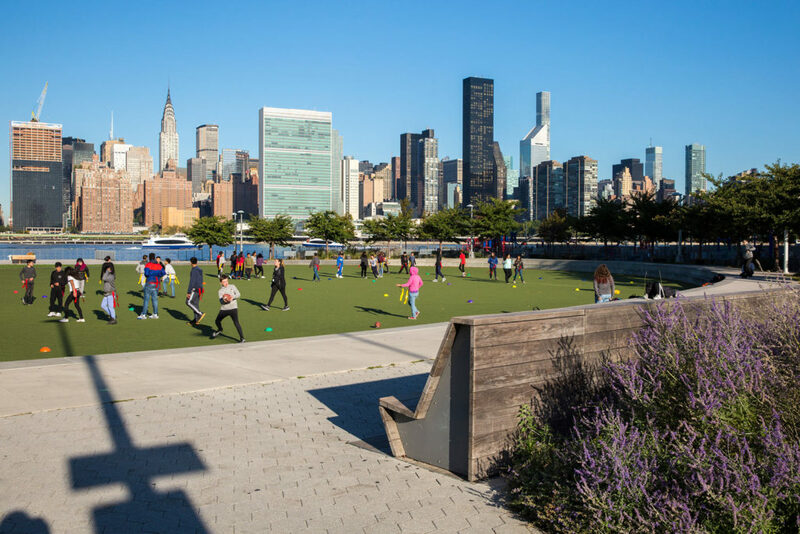 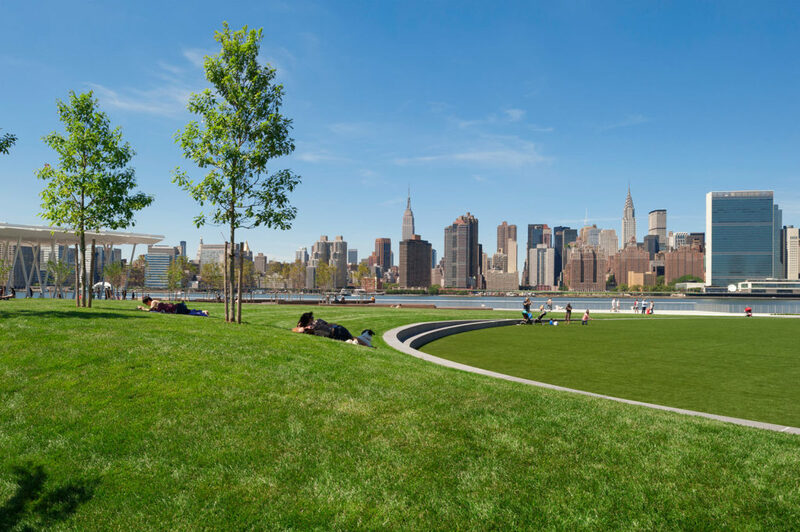 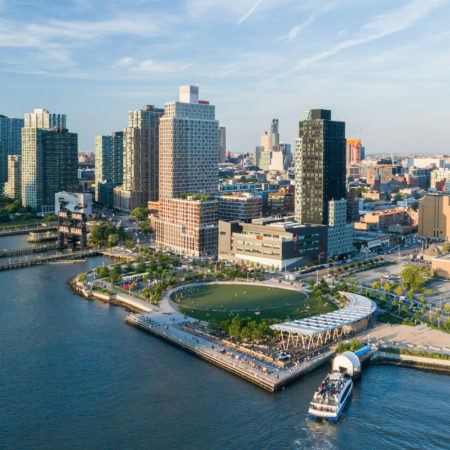 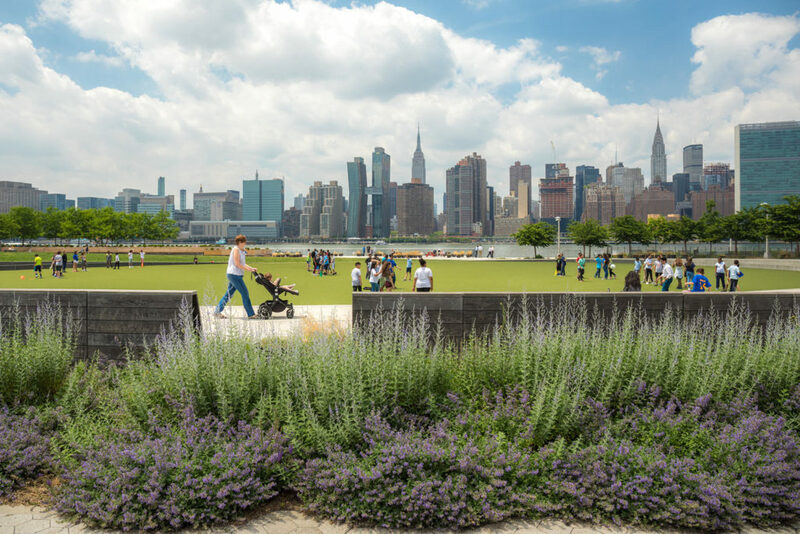 A new multi-use green oval defines the most generously open part of the site and offers views directly across the river to Manhattan. 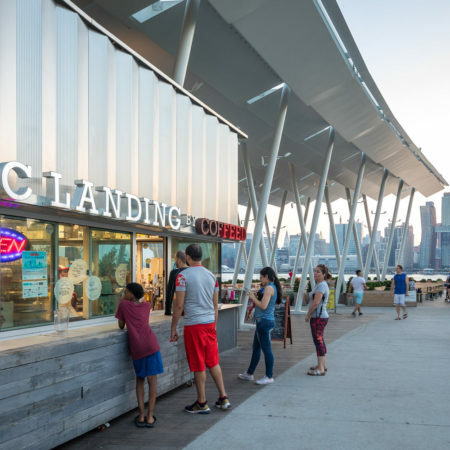 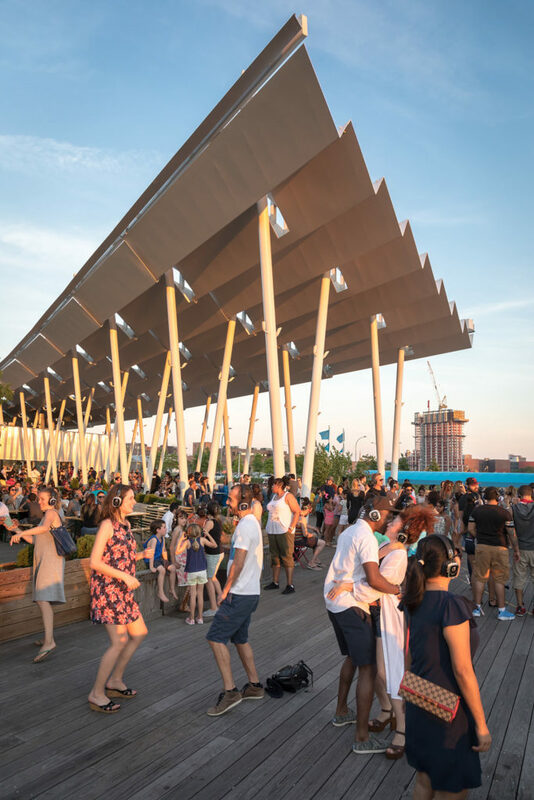 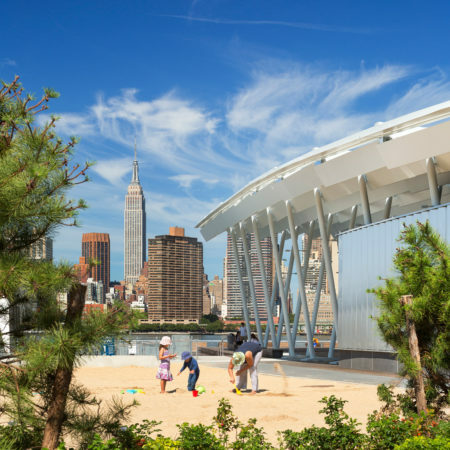 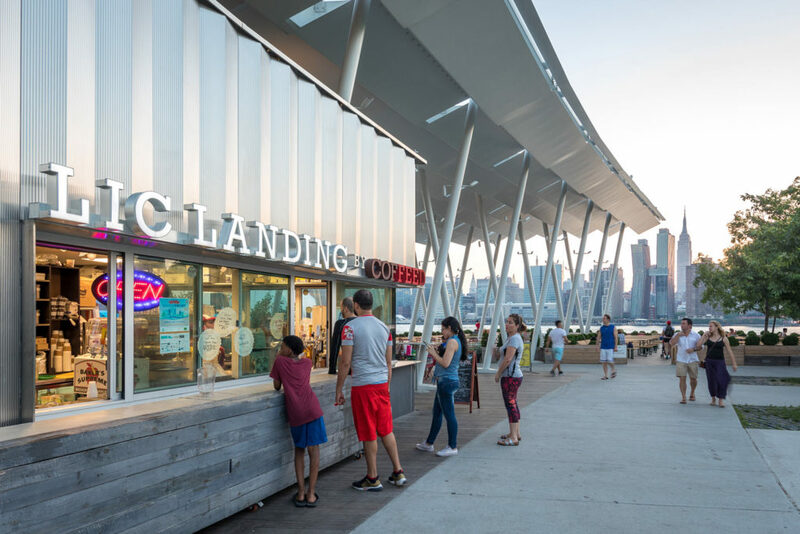 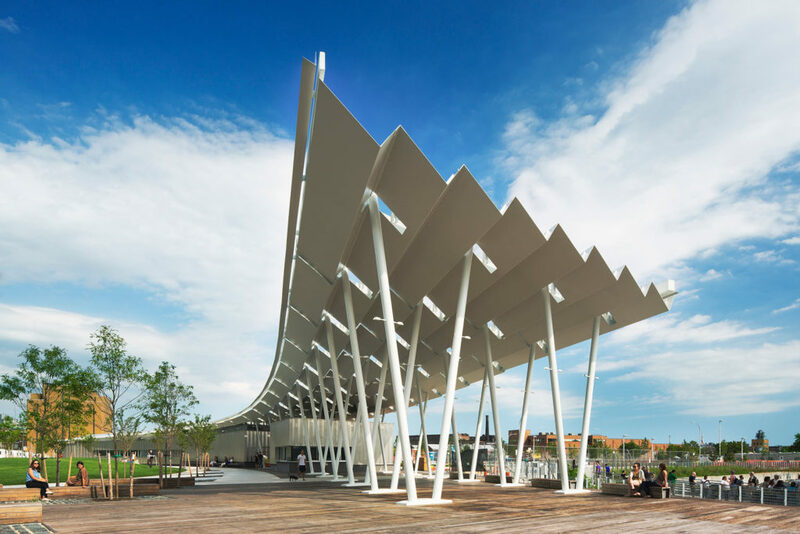 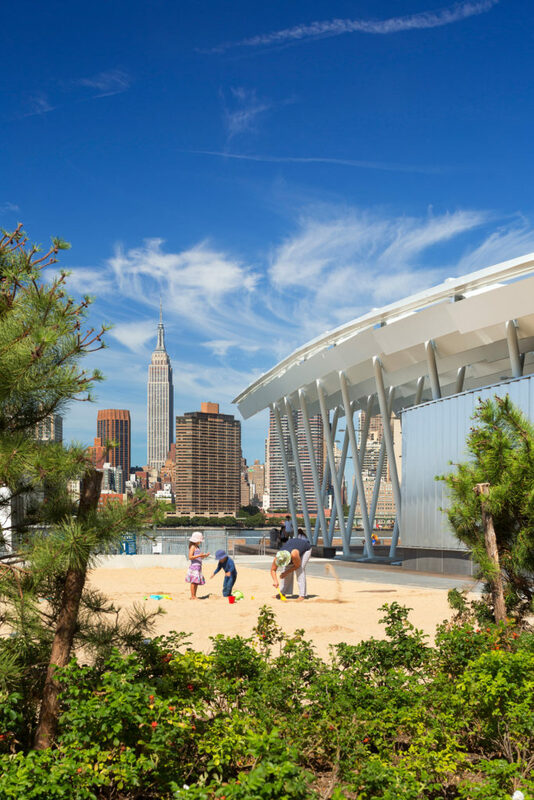 This green anchors the park’s north precinct and is framed by a continuous path and pleated steel shade canopy on the south side which follows the curve of the oval and offers shelter for a water ferry stop and concession building. 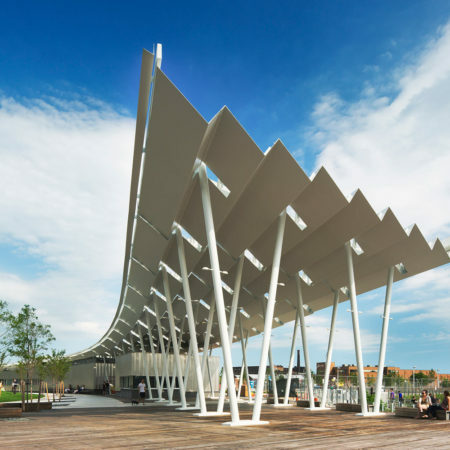 The rooftop photovoltaic panels provide enough power to support the pavilion and park lighting. 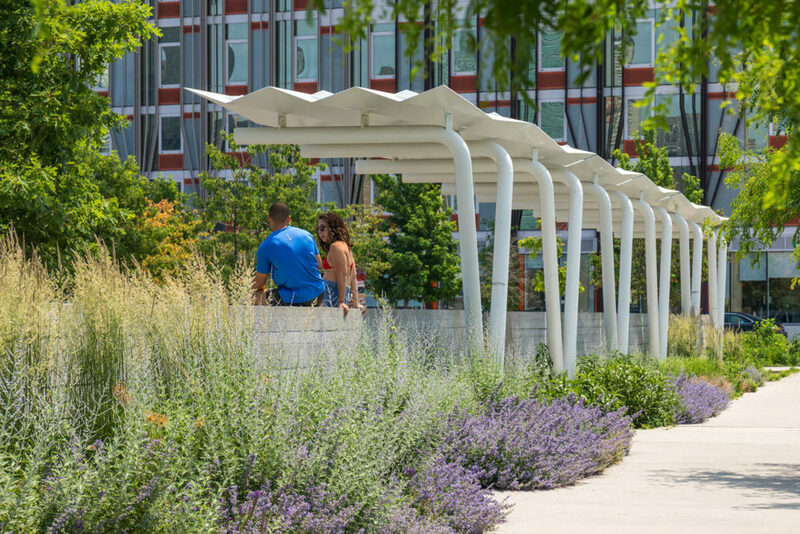 The walkway that surrounds the green unfurls to a cantilevered overlook at the southern terminus of the site. 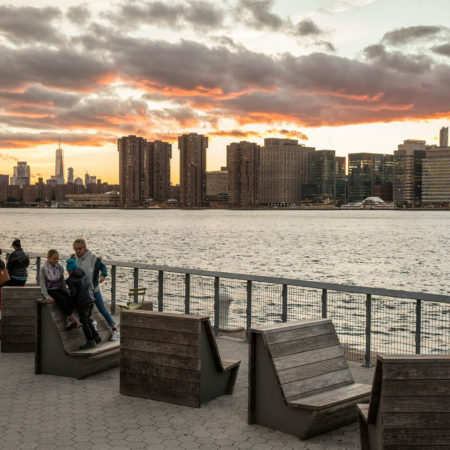 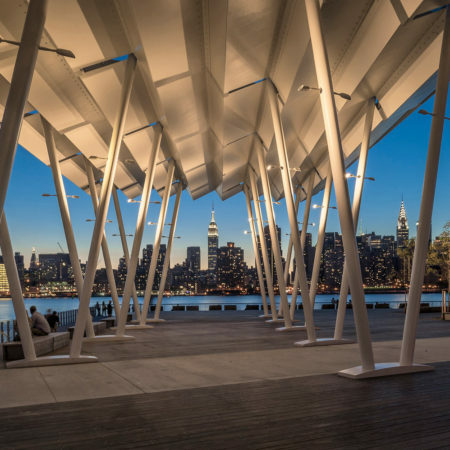 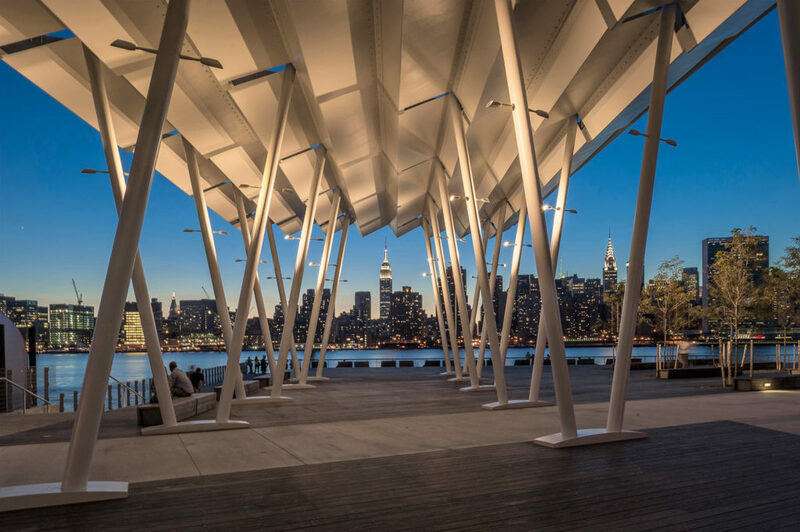 This overlook, a 30-foot high cantilevered platform with views of the Manhattan skyline and the East River, is at once urbane and otherworldly, bringing the city to a cantilever suspended over a new wetland water’s edge. 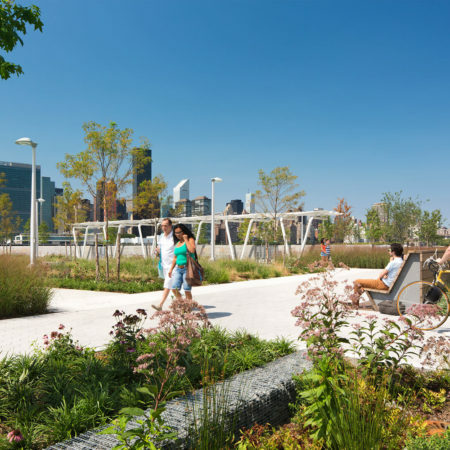 From this central path, slender paths extend into off route extensions to the water’s edge, connecting new wetlands and habitats for avian and aquatic species. 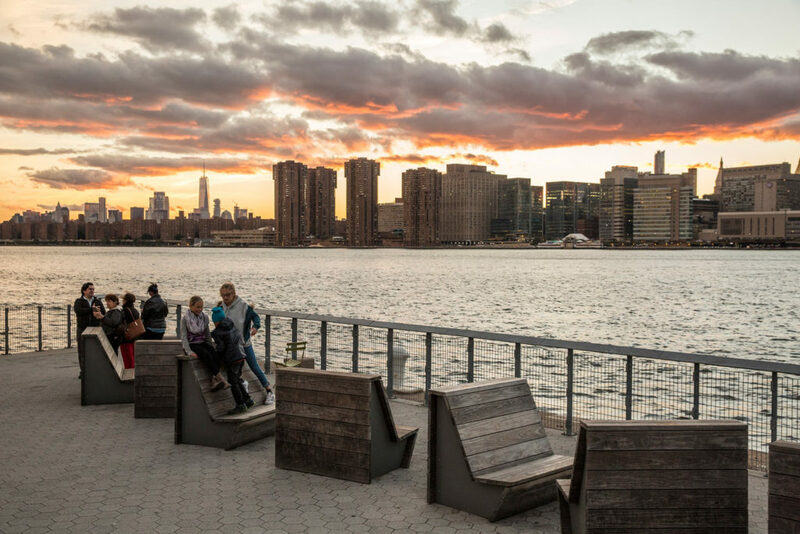 These elements, along with spectacular views, provide a new landmark and destination to bring the community to the waterfront. 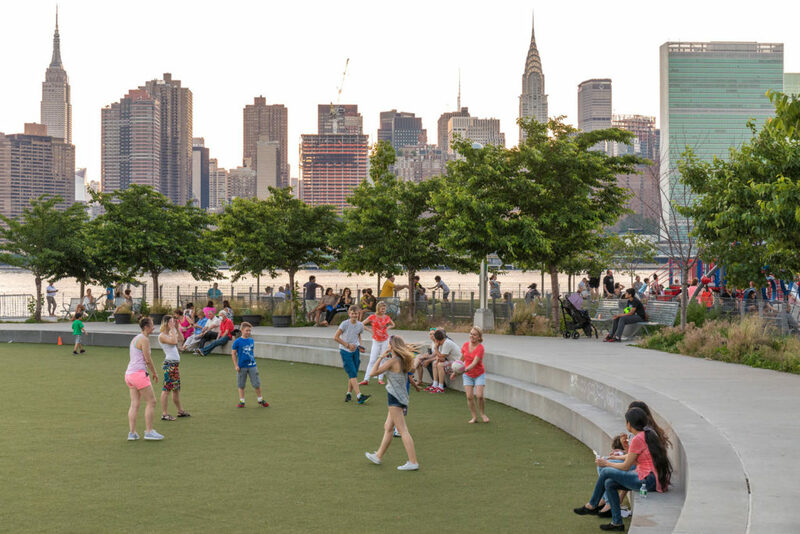 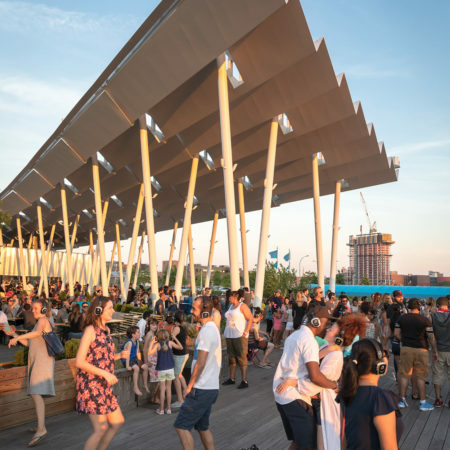 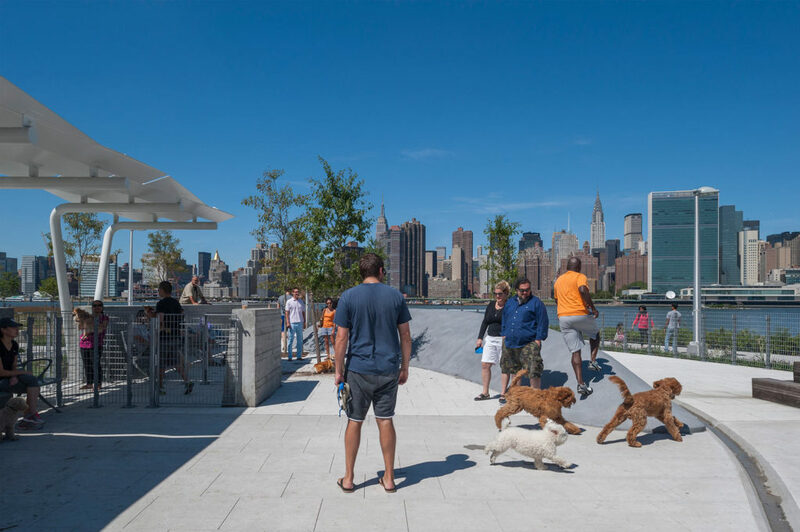 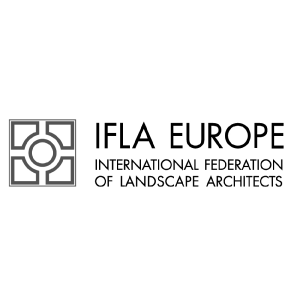 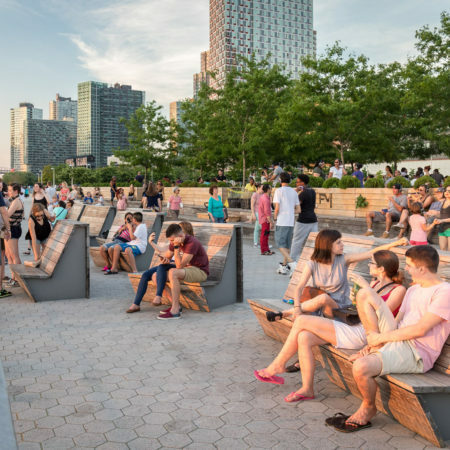 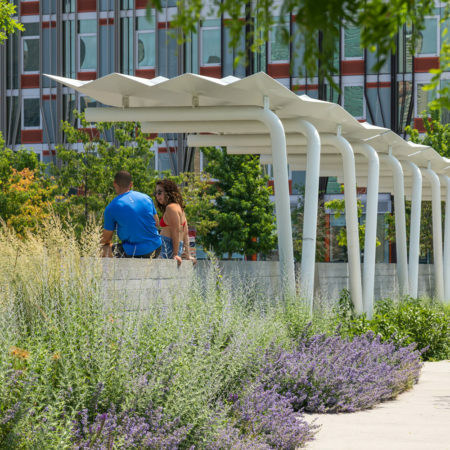 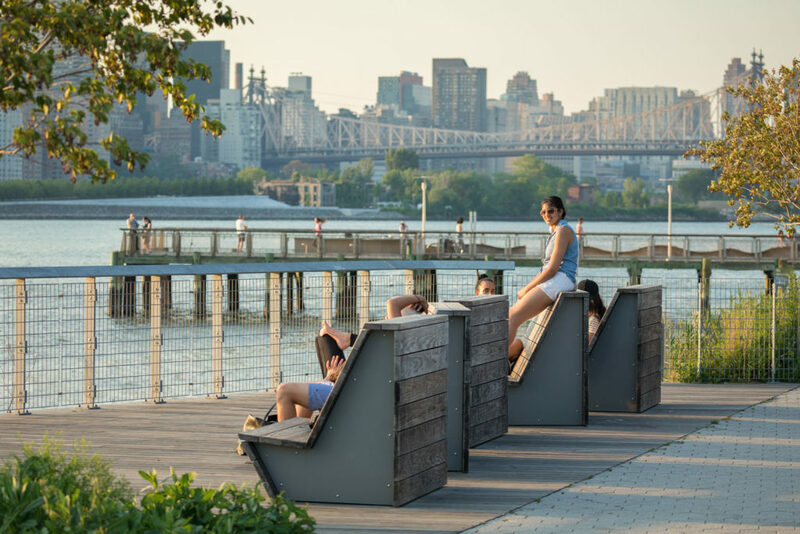 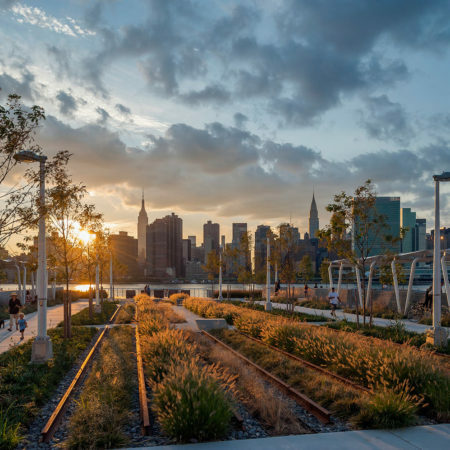 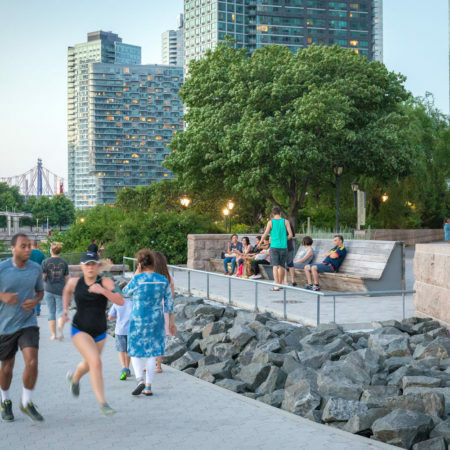 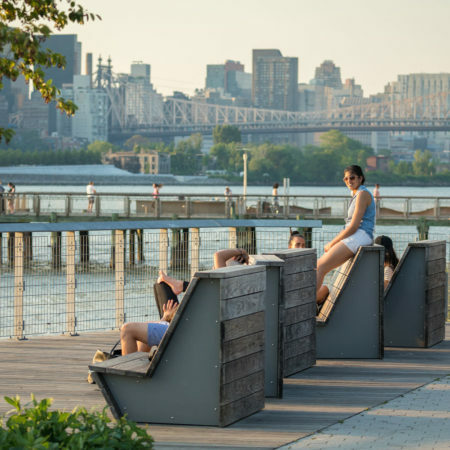 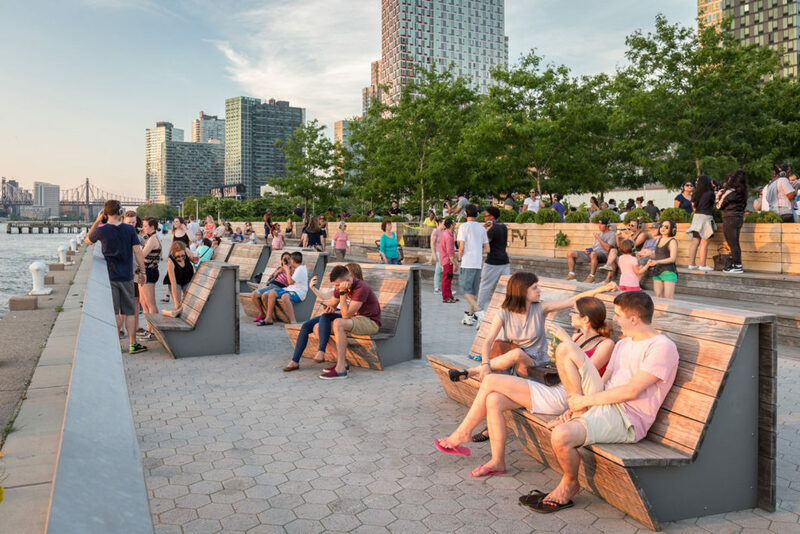 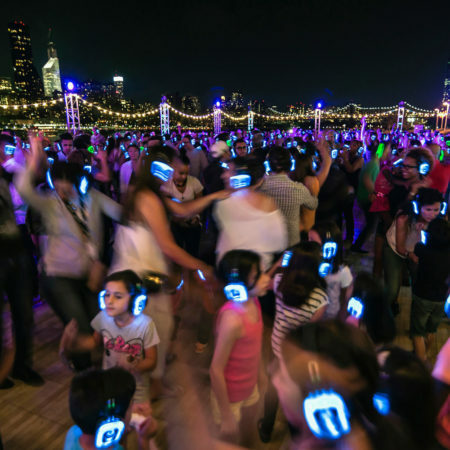 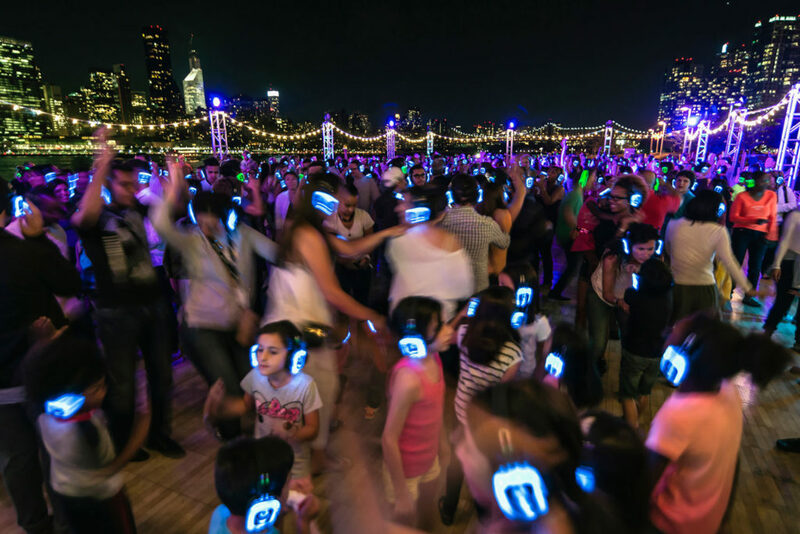 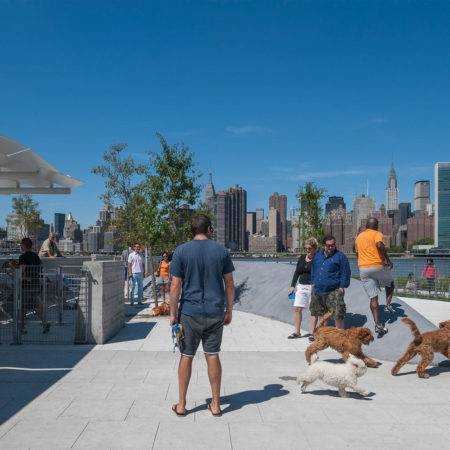 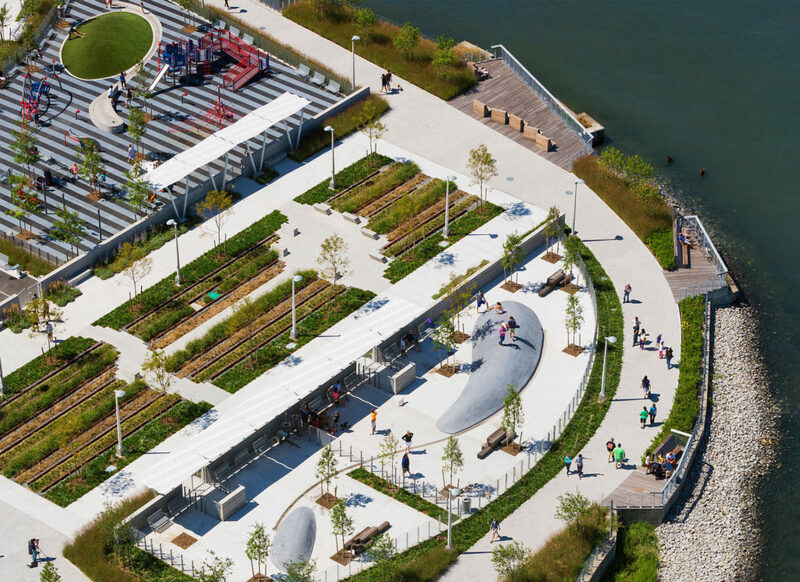 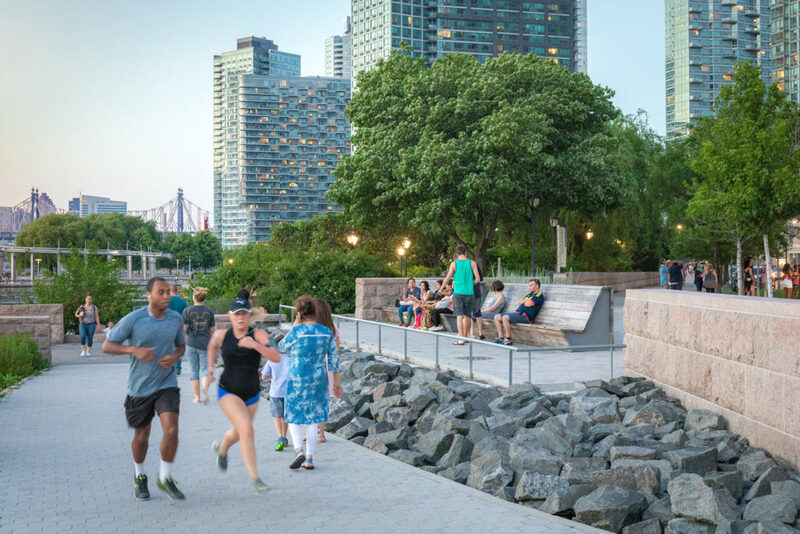 This innovative and integrated design creates a new sustainable strategy that weaves infrastructure, landscape and architecture, bringing the city to the park and the park to the waterfront. 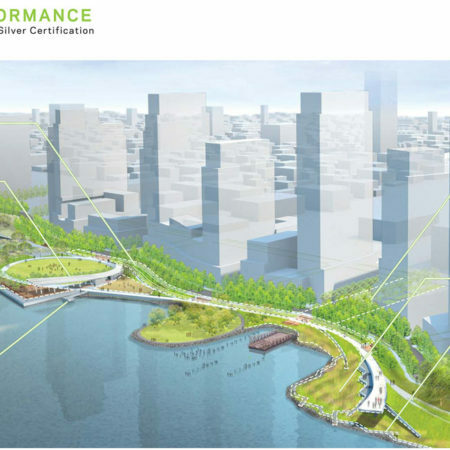 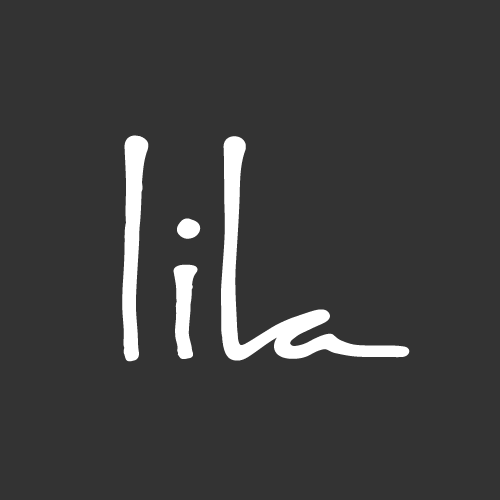 Project location (Street, City, Country): 52-10 Center Blvd., Long Island City, NY, U.S.A.